State fire investigators and Fairfield police are investigating the domestic violence incident that occurred after midnight. A 63-year-old Fairfield man was dead Sunday after a domestic violence attack in which he set the home of his estranged wife on fire while she was inside, before fatally slashing himself with a knife in front of police. Terry Whitney had been estranged from his wife since he was charged Oct. 31 with criminal mischief and domestic violence assault, and was under a court order to stay away from her, said Fairfield Police Capt. Paul St. Amand. 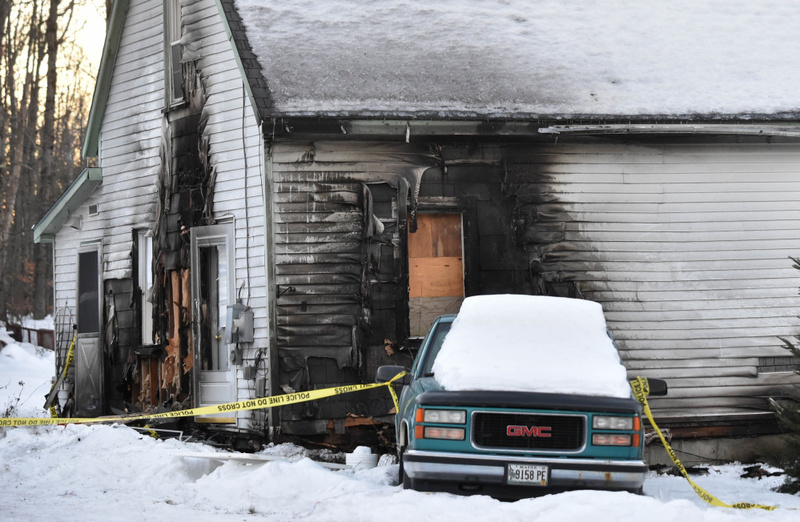 But shortly after midnight Sunday, Whitney returned to the Norridgewock Road home in Fairfield he and his wife had shared, cut the power to the house, and set fire to his truck and the home using an accelerant and a propane torch. St. Amand said Whitney was outside the home when he spread a gasoline and oil mixture on the siding before setting it ablaze with the torch. His wife called 911. When police and fire crews arrived, two sides of the outside of the home were in flames, but most of the fire was contained to the exterior, St. Amand said. Whitney never went inside the home during the incident, he said. While police were working to disarm Whitney, his wife ran out the back door, escaping unharmed, St. Amand said. The first officer to arrive confronted Whitney, who ran to the rear of the home. The officer chased him and deployed a Taser, but the nonlethal weapon was not effective because Whitney was wearing bulky clothing. A second officer arrived and also deployed his Taser, St. Amand said. Around that time, Whitney took out a knife and cut himself. Police then disarmed Whitney, and he was transported to an area hospital, where he succumbed to his injuries, St. Amand said. There were no immediate signs that drugs or alcohol were involved at the time, and Whitney did not say anything to officers during the confrontation, St. Amand said. The home, at 323 Norridgewock Road, sustained exterior damage but was rendered uninhabitable because of broken windows and concerns about damaged electrical wiring. St. Amand said he was not authorized to describe Whitney’s precise injuries. Before and after the October domestic violence arrest, Whitney was not known by police, St. Amand said. Responding to the fire were the Waterville, Norridgewock and Fairfield fire departments. The case remains under investigation by the state Fire Marshal’s Office and Fairfield police.